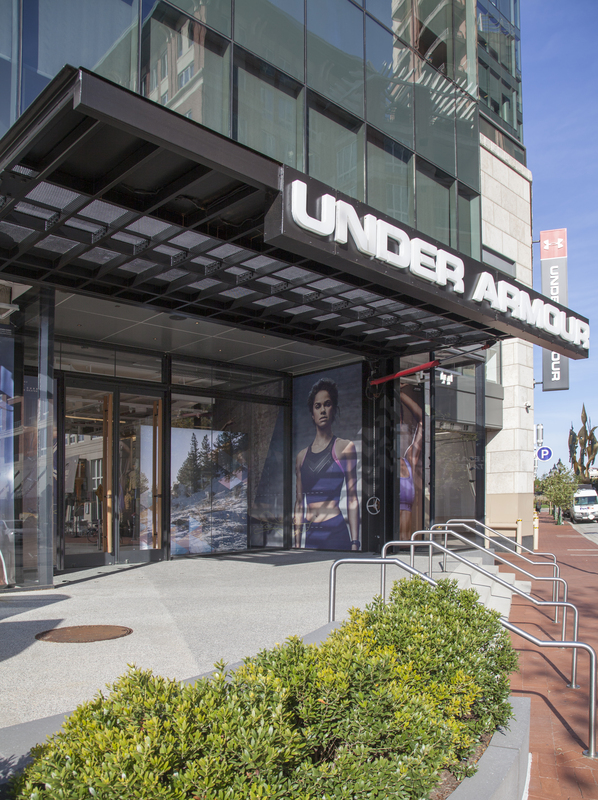 Ellison Bronze custom balanced doors help companies “make a statement” – and this is particularly true for two distinctive locations of Under Armour, Inc., the sports clothing and accessories company. 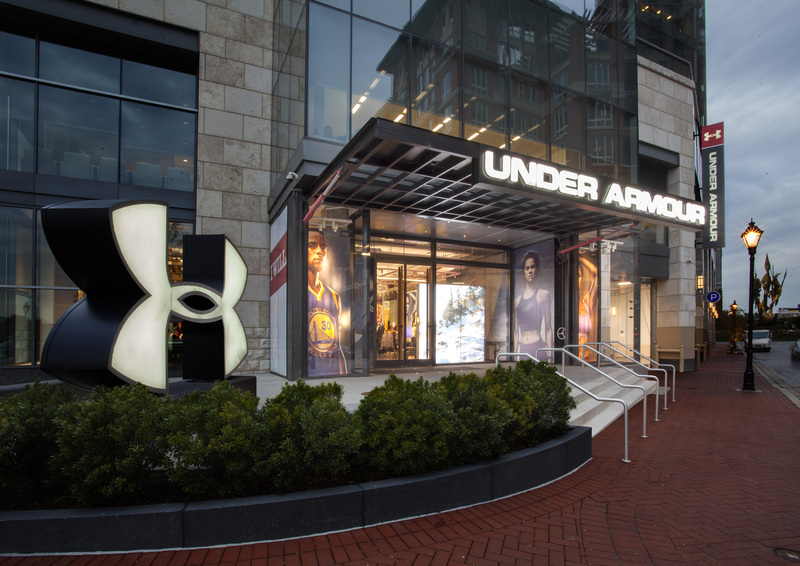 Under Armour recently began opening a series of “brand houses,” flagship stores that give customers an immersive brand experience. 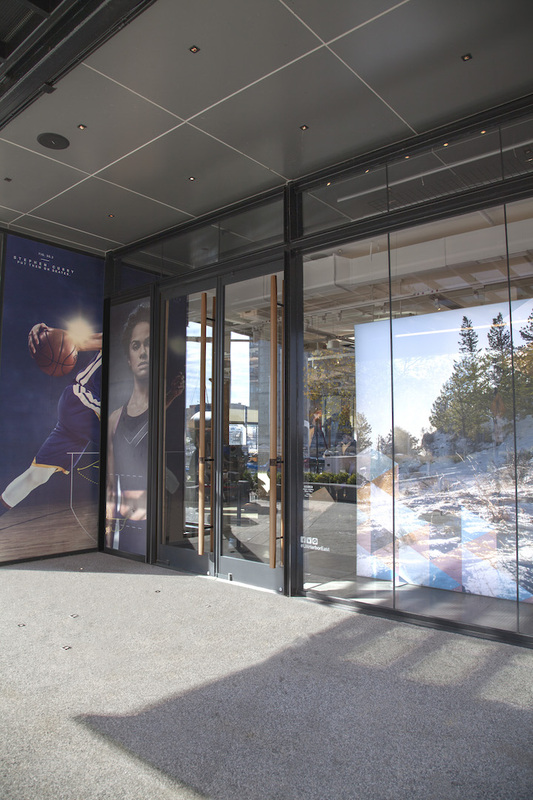 Brand houses represent an elevated presence, with more emphasis on design, digital presentation, customized interaction between the store and its customers, and a broader selection of apparel and footwear. The 30,000 sq. ft. Chicago store opened in March 2015 in the heart of the city’s Magnificent Mile, the upscale section of Michigan Avenue. The store captured top honors at the annual Design Awards of the Association of Retail Environments (A.R.E. ), including the Store of the Year award and Best Specialty Store (more than 25,000 sq. ft. in size). The store features two single and two pair of 11 foot tall Ellison Bronze custom balanced doors made of extruded aluminum, painted. The doors and vestibule are part of a newly constructed entrance of about 15 feet into the store, allowing the location to become what Walsh calls a “bold corner” at 600 North Michigan Avenue. The “oversized” doors were a challenge made easier by Ellison’s attention to detail and overall responsiveness, according to Michael Smoucha, Project Manager, Glass Solutions, Inc. of Elmhurst, IL. Glass Solutions handled the glazing and installation. The Baltimore brand house includes a 7’ x 9’ video board, “hometown exclusives” (themed merchandise that celebrates individual city neighborhoods), and beta testing of the company’s latest merchandise. Unlike conventional entry doors, an Ellison aluminum door is constructed from heavy wall extrusions that are made solely for Ellison and specifically designed to work in conjunction with their balanced hardware system. The door leaf’s horizontal top and bottom rails are attached to the vertical stiles using both welded and bolted connections, yielding an extremely durable and long lasting entrance. While Ellison balanced doors consist of heavy and robust components, they can still be opened with ease. A balanced door features an inset pivot point at two-thirds the width of the door, creating a balance that distributes the weight so the door requires little force to open. The inset balancing point allows for an easier open force, even against external wind and internal building stack pressure. Ellison provides detailed record keeping and full warranties – important when considering the extensive lifespan of an Ellison door. Every door made is imprinted with an individual project number (similar to that of a car’s VIN number) to facilitate easy tracking and maintenance. Furthermore, all Ellison balanced hardware components are machined in-house, which means that replacement components are always readily available. 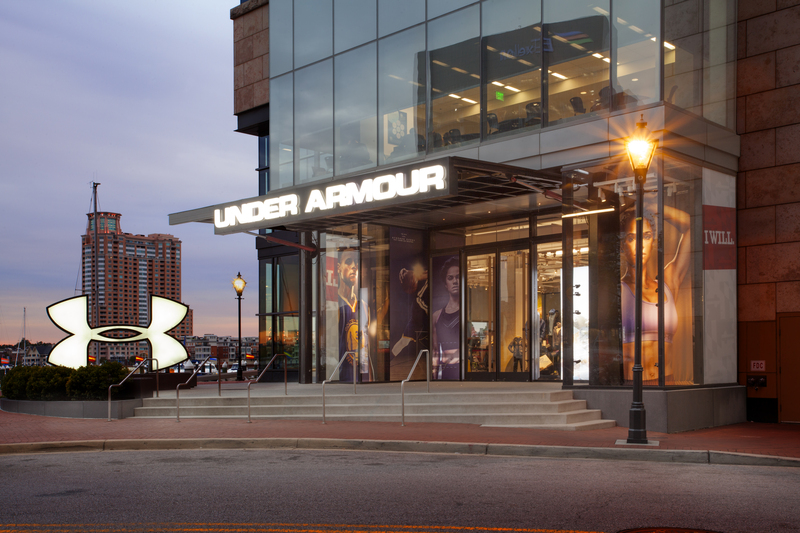 Under Armour, Inc. was founded in 1996 and has its global headquarters in Baltimore. The company operates in North America, South America, Latin America, Europe, Asia, and Australia. How important are these brand house locations? The article goes on to say that brand houses are not designed just to increase sales, but as the name clearly implies, build brand awareness and increase market share. 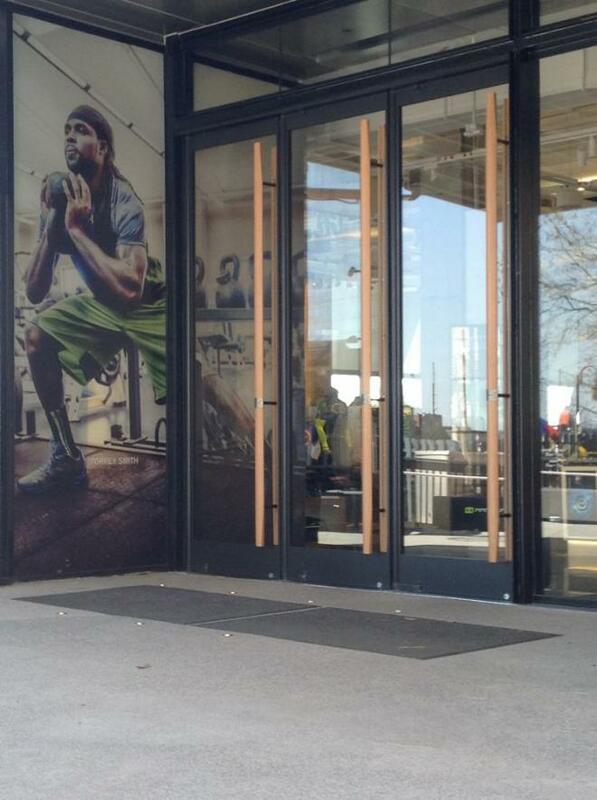 And, when Under Armour brand houses can look as impressive as the Chicago and Baltimore locations do, the company apparently also believes in custom balanced doors. In this case under the brand name of Ellison Bronze.